Mankind has been hunting for food and sport since the dawn of time. Few things in life can bring as much satisfaction as scoring a kill after tracking your game of choice. Hunting allows the modern person to enjoy nature and to get back to mans primal roots. It can be a relaxing endeavor for a single person, or a bonding experience for a group of friends. 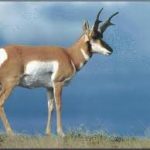 When it comes to big game hunting, antelope are a popular choice since they make good trophies. They also offer good meat and hides that can be tanned for a variety of purposes. The experienced and well rounded outdoors-man will move beyond the techniques of hunting and also learn how to handle his prized kills. While not every hunter will learn taxidermy and how to mount a trophy, they should at least learn how to skin their prey and prepare its meat. Skinning an antelope is a straight forward process. You simply need to follow the body’s natural guidelines. Once you learn how to make the initial cuts, the antelope’s skin will pull off cleanly without damaging the coat or the meat. The skin and the muscle tissue of an antelope are separated by thin protective membranes. This makes it easy to separate the hide from the carcass. One of the most common mistakes hunters make is to use a hunting knife to cut off the entire skin. Once that process is begun, the hunter is no longer separating the layers where they are naturally divided. You will start getting chunks of the meat attached the the skin. It’s also easy to damage the hide by cutting and puncturing it this way. The membranes that cover the meat of an antelope will also keep flies from laying eggs in the meat. They will protect the meat from spoiling and contamination. This is why it is so important to remove the hide while keeping these membranes intact. If the hide is properly peeled away, the membranes over the muscle tissue will actually dry out and protect the meat. The first step in properly skinning an antelope is to hang the animal up. This will keep the carcass clean and allow you to better use leverage and body weight when pulling off its skin. The sooner you skin the animal after the kill, the easier it will be to separate that hide. Make sure that you use good, strong rope. The last thing you need is to have the heavy carcass falling on you. You can hang the animal head up, by the neck, or feet up. To hang the antelope by the legs, first find the large tendon that connects the lower leg to the upper segment. Make sure that your knife is well sharpened, then make a hole between the bone and the tendon. Feel around until you find the lump created by the double jointed bone. Next you’ll need to sever the lower legs at the lower point of the two joints. This can be achieved by cutting apart the tendons around the joint, then snapping the bone over your leg or a firm object. The idea is to make a hole where a pole can be inserted into the upper legs and in between the bones and tendons. This should hold the animal up firmly with little chance of it falling down. Once the antelope is secure, it’s time to make the initial cuts. Cut the skin from the base of the skull, down the neck and back, and all the way to the tail. Next, cut across the shoulder blades and down the side of each of the forelegs. Finally, cut from the base of the tail to each of the hind legs. Now go ahead and start pulling off the skin. Use your body weight once you’ve gotten a good start. You’ll notice that the skin and meat separate cleanly.